In 1950, a few Catholic families met at the Villa Scholastica to discuss the possibility of establishing a church in Kenwood. Thomas Leone was requested to make inquiries to Bishop Thomas Welch for permission to contact the owner of what was formerly the first school in Kenwood. Mr. and Mrs. Gus Richardson had lived there for many years. Although the owners were not Catholic, because of a long friendship with the Leone family, Mr. Richardson agreed to sell the property, building and garage for $5,500 with the stipulation it would be used only as a Catholic Church. Fr. Rudolph N. Faith, was appointed the first pastor. 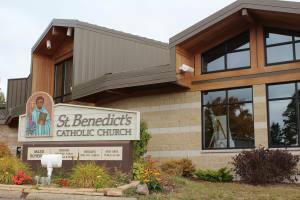 Bishop Welch dedicated it St. Benedict's because of the close association held by Kenwood members with the Benedictine Sisters at the Villa Scholastica. The first Mass was celebrated on Sunday, August 6, 1950. Parish registration was 48 families. The old church, property and rectory were sold and construction for the present church began in 1959. It was completed in 1960. The present rectory at 1419 Arrowhead Rd. was purchased in 1968. St. Anthony's Church was closed and incorporated with St. Benedict's in 1984. The Parish Center was built in 1989, with the foyer being named for St. Anthony. Statues and a piece of stained glass framed by Jim Makowski were brought from St. Anthony's Church. 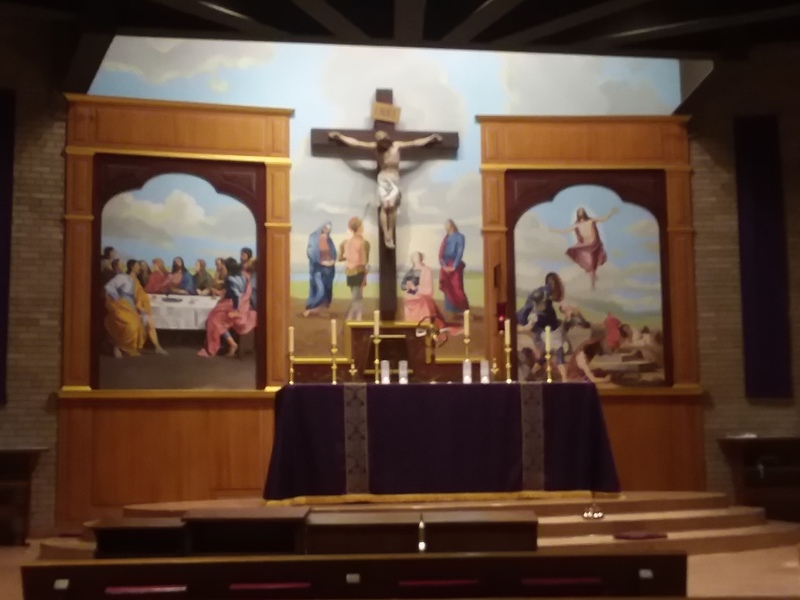 This helped the members feel a closer fellowship with St. Benedict's.